Last night we received our first significant snow fall in Granville. Though it’s not officially winter yet (December 21), it sure feels like it now and the snow put Jennifer and I in a good mood as the snow made the landscape a beautiful white. November of course is when we celebrate Thanksgiving and it provides a time to reflect on the blessings God has surrounded us with. Simple things like a warm cozy house are remembered on cold snowy days and healthy strong bodies when enjoying a workout BUT we certainly look at our extended multisport family as one of the biggest blessings. 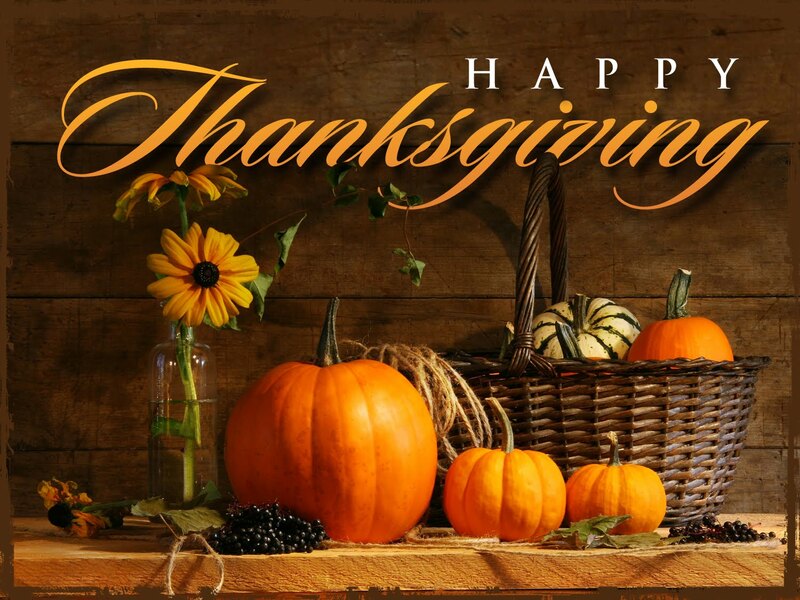 We’re hoping you and your family have a very Happy Thanksgiving 2013. The 2013 FIT Family Series awards arrived this week and will be mailed out next week to the top 3 in all the divisions. Wondering if you placed in the top 3? Check out the series ending points here. The Series Champion tri tops FINAL order will be placed on December 1 – please make sure if you’re a “series champion” to send your order to customerservice@hfpracing.com. MARK YOUR CALENDAR – HFP’s Annual Super Sale is January 1 to January 15th when registration opens for ALL 2014 events. This annual sale offers our loyal HFP customers 25% off ALL HFP Racing events and provides a great opportunity to get registered for the 2014 at significant savings. More information on this sale will be available in our January Newsletter and on Facebook. TEAM HFP RACING REGISTRATION DEADLINE – The Team HFP registration deadline for 2014 ends on December 1, 2013. 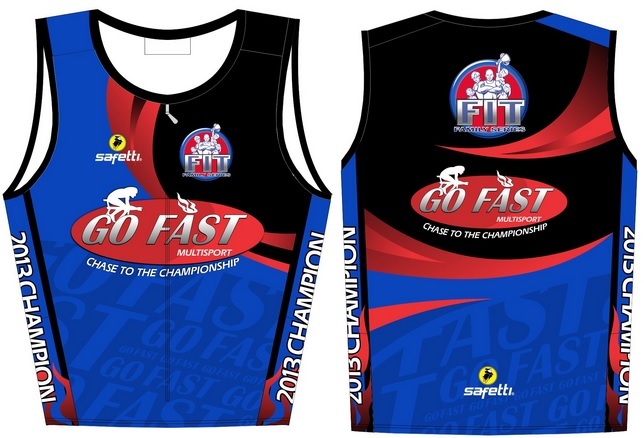 Go Fast Multisport is hosting a 2XU Fit Kit through this weekend at their store in Lebanon, Ohio. 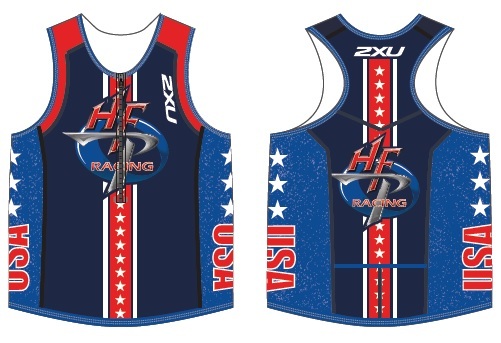 Get a chance to try on the 2014 Team HFP uniform before you order it. AMERICAN TRIPLE-T is on record sell out pace for 2014. We’re now at 80% capacity and it’s not even December! Thanks for much for your continued support of this awesome event. Don’t miss out on the 2014 race by getting registered now for the May 16-18, 2014 event. BIG ANNOUNCEMENT COMING SOON! We have some very big news we’ll be announcing in late December or the first of January. Stay tuned for more details. Need to jump start your off season swim training? Just need a reason to get back in the pool? Check HFP sponsor, Swim with Tracy, and get a taste for SWIM PERFORMANCE TRAINING by attending a group workout at Aquatic Adventures! On Tuesday and Wednesday November 26 and 27, training groups will be open to walk ins for only $5! Practice is from 5:45 am-7:15 am with Tuesday being the advanced group and Wednesday the novice group. Space is limited but the workouts will be designed to accommodate a large group….and to challenge yourself! Come burn some calories and have a blast doing it! RSPV’s MANDATORY! If you need an event to get yourself motivated, the entries are coming in for Tracy’s SWIM DISTANCE CHALLENGE ON DECEMBER 15, 2013, 8AM-NOON at Aquatic Adventures! New this year, Swim Distance Challenge participants will swim with UNDERWATER MUSIC and have the opportunity to get a POST-SWIM MASSAGE, for a small fee!! Join Tracy and sponsors, EnergyLab, TRIFormance AND Sheri Croston of The Power of Touch Certified Sports Massage Therapy for this fun event! Use it to test your off-season swim-focus results, as a PRE SEASON starting point ORRR to help neutralize the impending barrage of holiday caloric consumption! It’s not a race, just an event to get to swim a distance you’ve never before attempted or haven’t reached in a long time. Go to www.swimwithtracy.com for details and to register or pick a form up at the pool. While you’re there, check out the 2014 SWIM PERFORMANCE TRAINING- “PLUS” group offerings! This year’s format will make you even a more well rounded TRI-SWIMMER! 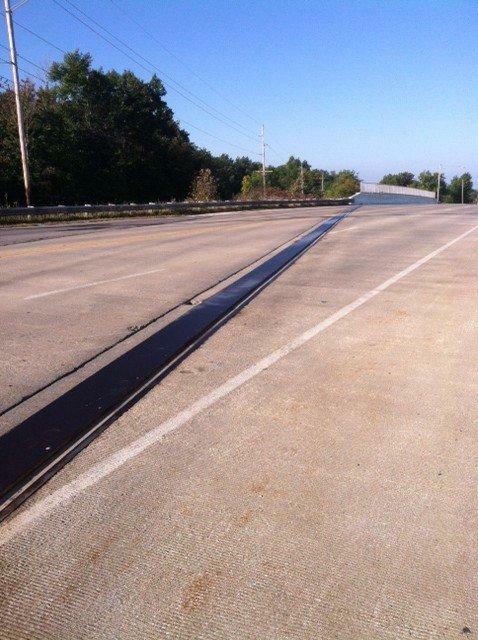 Vermilion, OH – Soon after the Linwood Park Triathlon & Duathlon in 2013 the race committee members from Main Street Vermilion started looking for a solution for the bridge crossing that continued to cause accidents during the cycling portion of the race. The section of the bridge causing the issues are two very wide expansion joints that are at a very bad angle making it difficult to cover up and create a safe crossing for all cyclists. However, Main Street Vermilion received approval from the Vermilion Service Director to outsource a solution. A local contractor was brought in to come up with a solution. In the end a decision has been made to cover both 30 foot expansion joints (in the cycling lane) with a low profile steel plate that will be tack welded to the existing metal plate on the expansion joints on race morning. The metal plate will then will be covered with a high grade industrial mat that will be concrete nailed into the bridge. This solution will provide riders with a full lane in which to safely cross over the bridge. HFP Racing would like to thank Staicey Scholtz and everyone at Main Street Vermilion for their efforts in finding the solution to this problem. A word of caution is still warranted as this will ONLY be available on race day and anyone pre-riding the course during the year will still need to be very careful when crossing the bridge. Another end of the season in Miami! 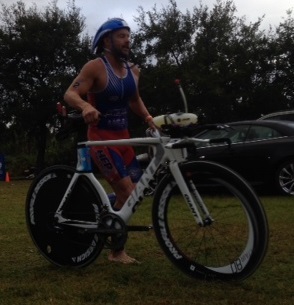 This is my 5th year in a row to end my season at the MiamiMan Triathlon (half iron distance) and though I did not attain all my goals I was quite pleased. I don’t know if a perfect race is ever possible but it keeps me setting the bar higher each year (even though I’m getting older). It’s been really interesting for me to be finishing the season at the MiamiMan during my complete run through the 40-44 age group. It was my first race as an official 40-44 participant in 2009 when I was 3rd (and 10-lbs heavier). That was a smack in the face and provided me with a huge goal for the following year to win the masters title. 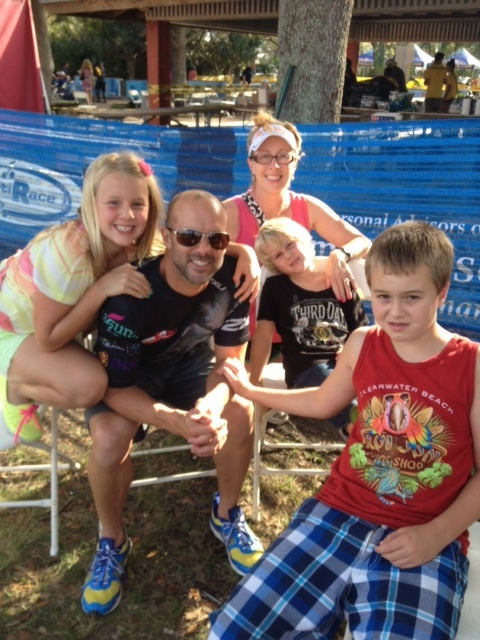 Up to that point I had not accepted being a “Master” – I still wanted to be that guy that was competing against all the age groups gunning for the overall win but that race allowed me to accept my position as a “Master” and gave me some new goals. The following three years I was blessed with solid races and came into this year as the 3-time defending masters champion. Though I was another year older I was convinced my best race was ahead of me. It was a very rainy and stormy morning when we left the hotel and by the time we arrived at Larry & Penny Thompson Park the air was thick. My 1/2 mile run over to the secret bathroom had me sweating like a pig. I was absolutely covered in a drenching sweat without even getting my heart rate up. I knew this could be a very interesting day. The forecast called for more strong storms to come through in the morning and then clearing later in the morning. That was going to make for sauna like conditions on the run. Yikes! 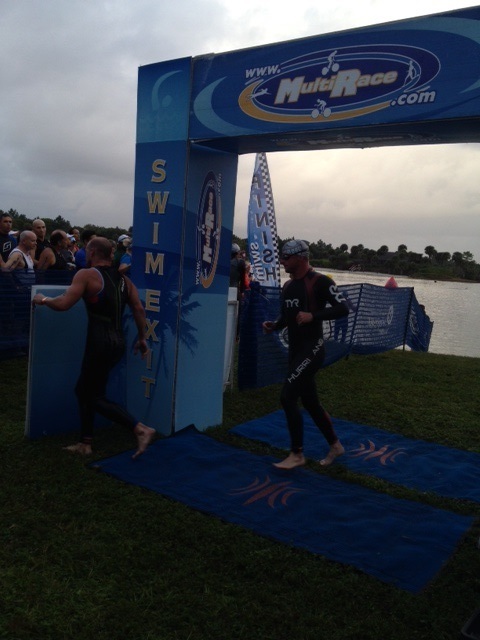 I warmed up a little bit more on land before I headed over the swim start feeling very confident in my swim. The 40-44 and the elite wave started first which is nice on this 2-lap swim course. The gun went off and I placed myself with the lead pack of 6-8 guys gunning for the holeshot at the first buoy. After some mosh pit like action at the first turn which ripped off my swim cap, the pace seemed easy and the group pretty much stayed together for the first lap. The pack broke up to just 4 during the second lap and we all exited the swim around the 29 minute mark. For me the swim was super easy…I attempted to pass the pack on the first lap but it seemed like I would need to work really hard to get through the group. I opted for a position in the back of the group which allowed for me to keep my heart rate low and gave me time to get energized for the bike. My time of 29:15 was the fastest in my 5 years – First goal accomplished! Out on to the bike I knew immediately that I was going to have a good ride…the legs felt strong and I was riding along at 41-43kph with little effort. I continued to feel good and focused on my nutrition and keeping smooth. My position on the bike was very comfortable the entire ride and I never felt any issues. 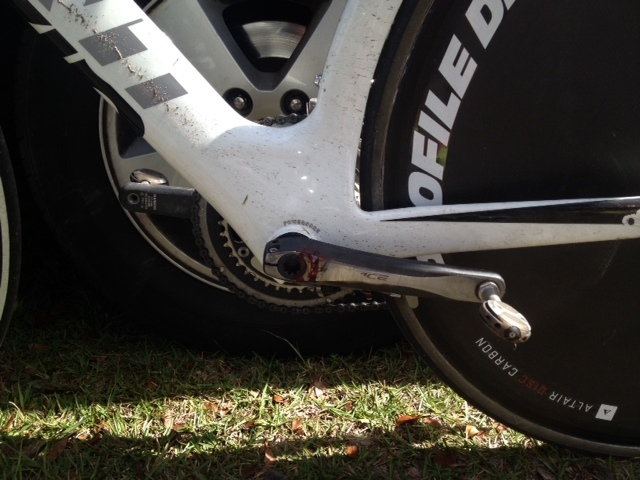 This a testament to the new aero position developed during my build-up. It’s amazing how good a long ride can feel when you’re actually sitting on the seat properly. The weather continued to be an issue with some crazy hard rain coming down and strong cross winds but I found them much better than hot sun. I’ve always struggled a bit during the last 20k at this race because the wind is always in your face on the return trip to TA. The course is a bit of a lollipop with a 15 mile loop at the end that you do twice and the return (the stick portion) as you head back towards the TA is always windy. I decided in advance I would not look at my computer during this section and focus on a good rhythm rather than obsessing on my pace. This was a good call and I enjoyed this section for the first time giving me some good MoJo starting the run. At the end of my ride my bike looked like I went for an off-road ride. Since I went without socks I also left some ankle meat on my left crank arm from some aggressive pedaling. My bike time of 2:15:54 (24.72mph average) was the second fastest overall and the fastest time for me in my 5 attempts at MiamiMan – Second goal accomplished! As soon as I got off the bike the sun decided it was a good time to come out…ahhhh! As I headed out of TA I was very pleased as my legs were good. The bike ride did not take too much out of my legs and was anticipating a great run. The problem I encountered was that despite my legs feeling good the heat and humidity were almost unbearable. Each time I picked up the pace I felt like my skin was on fire…I just could not get to my goal pace on the run. However, since I did not wear a watch and I still had good legs (and was passing olympic distance folks with ease) I was not aware that I was running that slow. In all 5 years of racing this event never has it felt this brutal on the run. All the extra moisture from the rain obviously made it much worse. The sections of the run that were in what I would call a “scrub brush” area around the zoo were just brutal – No wind, no shade and not the best running surface. My run time of 1:43:17 was the second slowest time in my 5 attempts and a full 13 minutes off my goal pace of 1:30 (7:00min pace). At the finish my legs still felt good which was a little frustrating. I felt like I could go another lap and I probably could at that nearly 8min pace I was running. Though I was a little disappointed with my run, I did defend my Masters title (which is always priority #1) and in convincing fashion too (by over 15 minutes). 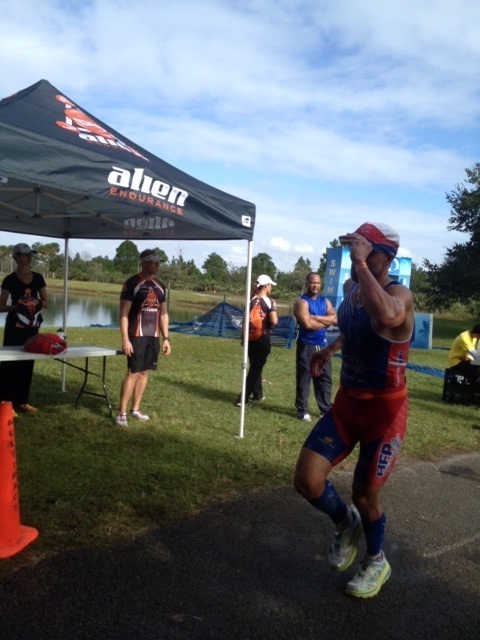 In the end I recognize that there are some limitations when racing in Florida (in November) and training in Ohio. However, I believe the biggest factor was trying to build-up my run in just 4.5 weeks. I swim and bike a good deal year round but seem to always find a reason to skip the needed weekly long run and if I could of had a much bigger run base I’m sure I could have battled through the heat much better. This just just gives me more motivation for the off-season. I can’t wait to turn 45 so I can get faster!